I wrote a poem at the beginning of this new year, during a period of absolute, and utter exhaustion, when I needed to remind myself that I was not alone on this challenging journey of trying to maintain a creative connection with the art of quilting, and still care for all of the people that I love, who are still so needing of my help. As I was writing my prose poem "More Than a Sisterhood", I used the term 'sistership'. It simply arose from an innate state of recognition of shared kinship, and the feeling of such an intense bond between all of us. Whether you make quilts for AAQI, as I do, or bid on them, and purchase them, as many of you have, or if you just have so many challenges in life from caring for others in your own lives...I feel your kinship so dearly. I feel it so strongly that it feels like 'more than a sisterhood'. 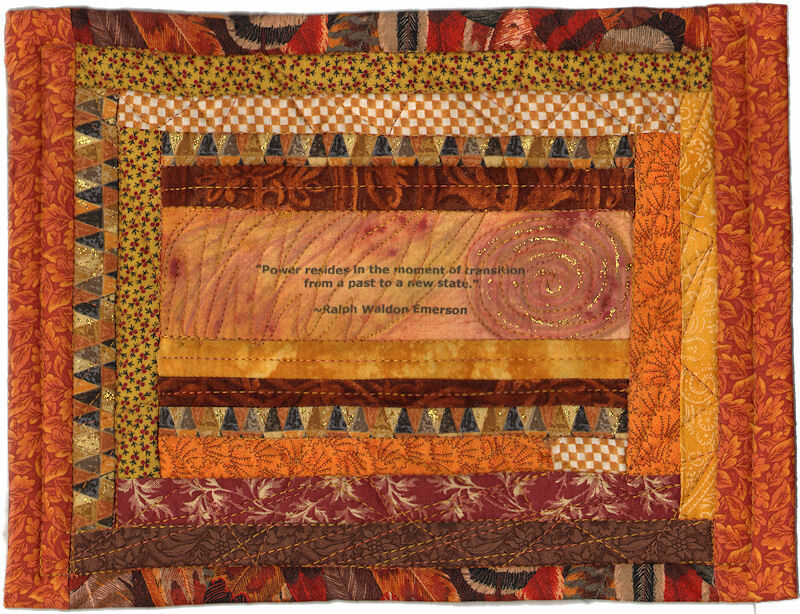 I shared a sentence of connection in a letter to Beth Hartford, our wonderful quilt registrar at the Alzheimer's Art Quilt Initiative and she loved the sentence so much, she asked if she could share it with the AAQI Board of Directors. Well she did, dear woman that she is. So, I sent her the entire poem and she wrote me back that she "LOVED" it. Bless her dear heart. So, today, I thought I'd share my poem with all of you. We are all, so much more than just a quilting sisterhood...we feel such connections with one another, true friendships over the airwaves of our shared caring, challenges, emotions, and love of so much more than just sewing and quilting. 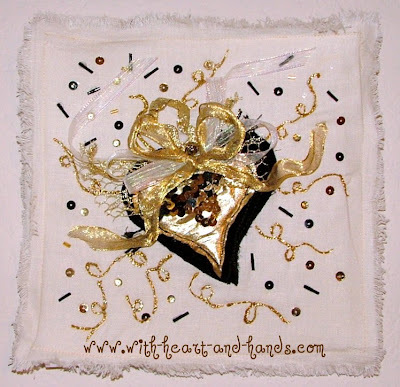 My commitment is quilting for a cause, yours might be a different cause, or different commitments...but we are all connected by our heart strings of the love of quilting through so many different and exhausting challenges in our lives. We travel the dark, and lonely road at night, with eyes barely open from exhaustion. We place one foot after another, step by careful step. We carry our own heavy hearts, yet hold on tightly to our loved one's hands. When we finally reach the end of our challenging journey, we discover a miracle. We were not walking this long, and winding path alone. We had a sistership of many. An invisible army of sisters, all connected by our heartstrings. We were all just doing so much, and trying so hard. We forgot to look up. To see just how many of us had been right there, all along. So many others who know our pain, share our loss, and understand our journey. It takes an entire army to fight Alzheimer's Disease. An army awaiting each, and every small miracle. And we do our best to hold ourselves, our loved ones, and this unrelenting battle, together. It is a hard and challenging sistership...this journey of ours.....but we have the blessing of understanding one another's commitment to this cause, as well as our shared losses. We truly are a Sisterhood of Quilters, in all ways! 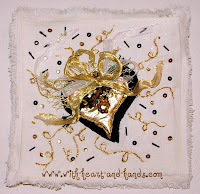 And don't forget...my little art quilt is up at auction and is needing a bid. Every $5 helps so much in funding Alzheimer's research. It is only has one bid so far and needs another one, please! Let's see if we can get the charitable energy rolling again. Wendy Koenig...bless you again, for the lovely art quilting supplies you mailed me. These are your beads and trims and they have enriched my little piece with the gold of friendship and remind me every day that I am not doing this, alone! When I made this little quilted square, I knew it would be too 'fluffy' to donate to AAQI, so I hung it up on my quilting art nook wall whee it now reminds me of how much I cherish my quilting sisterhood of friendships! 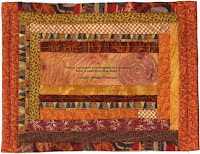 Michele Bilyeu Quilts With Heart and Hands for the Alzheimer's Art Quilt Initiative (AAQI) Join in my Liberated Quilting Challenge...and buy or donate a quilt, today!! We are changing the world...one little quilt at a time. Your beautiful poem truly touches my heart. It made me remember after my Mother died looking up and seeing my sisters of both family and heart who had been there for her and the many that are still here for others. Blessings to all. You must be thrilled to have such a reaction to your poem. Congratulations. Beautiful poem and sentiment, Michele. Thank you for sharing with all of us. Beautifully shared words that so many of us understand on the deepest of levels. Thank you for sharing with all of us! Your poem reminded me of the first time my Mother called, "Mommy, Mommy" from her bed in the room next to mine and she thanked me and held my hand when I went in to turn on a night light and tuck her back in. Thank you for the sistership. Oh Michele, what a beautiful poem and beautiful quilt. And, so very nice of you to help this very worth while program. Thank you for helping to make this world a better place. I still LOVE your poem!! Your insight is amazing and you absolutely "hit the nail on the head" in expressing what so many of us are feeling but don't have the ability to express. Hugs!! Your heart art is so cool! I love this piece! What a touching poem Michelle and so true.